Becky Downie continues Great Britain's medal run at the European Gymnastics Championships in Montpellier with silver on the high bar. 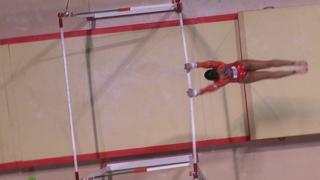 Her 15-year-old sister Ellie won all-round bronze on Friday and came fourth in the high bar competition. The elder Downie sister scored 15.233 to secure second, behind Russian Daria Spiridonova who took gold with a score of 15.466.